Ya'll remember Sisyphus and his big ole' rock, right? Sometimes I can relate when it comes to my blog. It's not that I don't enjoy writing or that the task is repetitive, but rather that I have so much good stuff to write about I can never get it in. I always end up trying to play catch-up by writing about past events. Sure I could skip ahead to the last couple of days, but that always seems to mean leaving something signficant out. So there you have it. 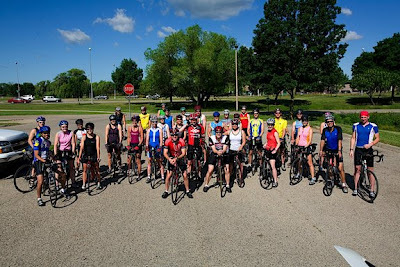 We need to rewind about two weeks to the awesome Wisconsin Ironman Brick Adventure (WIBA) presented by my very own EvoTri team. This weekend is one of only a couple times each year that the entire team gets together so good times and good training are assured. Presented by Team EvoTri may actually be a bit misleading since the original WIBA was -and still is- the brainchild of IronWil. This year the event was taken to an even higher level through the mad planning and orgaziational skillz of one Robby B.
I was accompanied on the weekend by my wife Cara and our small offspring. We've had races or events that required a good deal of travel for the last 3 weekends. 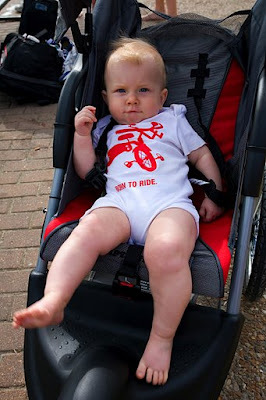 We're hoping to condition Jonah to the rigors of travelling before the long plane trip to Kona in October! Friday afternoon the team got to go on a very cool tour of the Saris/Cyclops headquarters and factory. Very interesting mult-purpose facility. The Powertap assembly line and quality control area was enough to make any self-respecting power geek go weak in the knees. One thing that really impressed me was how many different quality checks these things go through to make sure it arrives both accurate and durable for the long haul. Saturday was the big training day. Since I am not racing IM Wisconsin, I didn't really feel any pressure to really hit the course hard, although I was planning on getting in a long solid day. 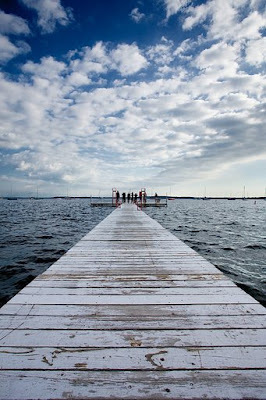 The morning started with a swim in Lake Mendota as opposed to Monona where the IM is held. I actually liked this better. I rarely get in open water swims, so I always love it when I can just get out in the open and go. There were some decent swells in the lake which added to the fun! On to the bike where I had a nice leisurely start with some friends from Bloomington and my teammate Charlie. I always enjoy riding the Madison course- I think it is both gorgeous and challenging. Somewhere around an hour or so in, it was just me and Charlie. I was trying to explain that the section we were on out to Verona is what everyone calls the "flat section" but I'm not sure he was believing me! Soon enough grasshopper. Charlie was worried about holding me back, but I assured him that there was more than enough suffering to be had on the second loop if I wanted it! I left Charlie in Mt. Horeb with Robby to re-group. I took off and rode hard for about an hour until encountering Michelle with a flat (and a flat spare!) part-way up the big Old Sauk hill. We got Michelle rolling again and I finished the first lap of the course with her- more quality time with the teammies! Second lap was time to hurt a bit. A couple big storms blew in, but I managed to mostly ride in between two really nasty storms. I rode most of the second lap alone with a goal of 200+ watts ave (which is harder than it sounds because there is a lot of coasting). I hooked up with a 2-time Kona qualifier -Dan- and rode with him from Verona back to Madison. Dan is apparently super-strong on the bike, because for awhile it was all I could do to keep him in sight. Back in Madison I was able to meet up with Stu and Michelle for a short brick run. I was thoroughly trashed and it is only through the magical powers of Taco Bell that I got through the rest of the day!! Sunday morning was my turn for the jogstroller. 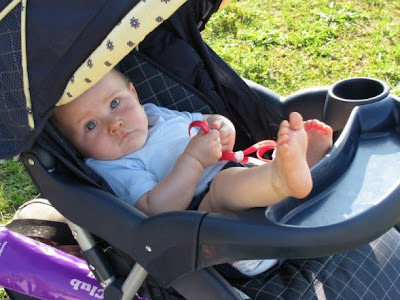 This was going to be Jonah's longest stretch in the jog stroller and he did great. We went 1:40 and he slept for a good chunk of time. I had a nice run with Laird from Canada. Good times, good weekend. I almost feel spoiled that I get to see the whole team again within a month at Steelhead! This past weekend (see I'm getting damn close to the present!) was the Lakeside Triathlon in Decatur, Illinois. Decatur is about an hour south of us and a big contigent of Tri-Sharks, including my wife were headed down for this in between sprint and olympic distance race. 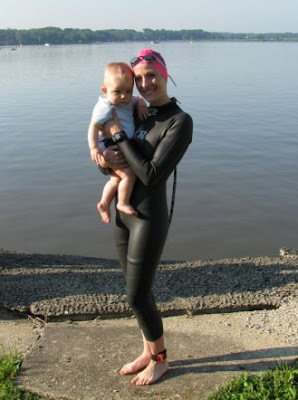 Cara played support crew at Hy-Vee and now it was my turn to turn Jonah into a triathlon spectator extraordinaire. Cara has been doing way less swimming than me and I'm doing good when I make it twice a week. She has been doing about the same amount of biking, but was hoping to offset this with #1 a decent amount of run training and #2 a super-efficient swim stroke. Despite whining about all the people she KNEW were going to beat her before the race, she pulled out a solid 3 event showing to win her age group! Way to go fast mommy! Jonah stayed awake for the whole race and played the throw my pacifier on the ground game.